Babette Gallard and Paul Chinn are riding to Rome! Babette and Paul have ridden from their home in northern France to join the pilgrim route from Mont St Michel to Chartres - The Pilgrim Routes of Mont St Michel . They will follow the Loire and meet one of the "fingers" of the chemin de St Jacques at Vézelay and then on the border of Switzerland plan to join the Via Francigena and follow it to Rome. The route of the Via Francigena was first written down by Sigericis the 10th century archbishop of Canterbury. We have recently become "friends" of the Via Francigena Association and are grateful to them for the excellent maps and guide books. In July Babette wrote to say, "Just to let you know that we are doing well and are currently south of the Loire in a town called Chatillon sur Loire, sheltering for a day from the high 30s temperatures - about 450 kilometres along the 1,600 kilometre total route." However, the latest news we have, sent about a month later, is not so good. "Gwen is currently lame and we are resting with my brother in Switzerland." Oh dear! We do hope that Gwen recovers quickly. The Via Francigena travels from Canterbury (England) to Rome. It has a history as old and as rich as that of the Chemin de St Jacques, the first known written records were produced by Sergeric in the 9th century, but despite this it is far less well known. On July 2, 2006 we left from the Mairie (Town Hall) of our home village of St Aubin Fosse Louvain in the Pays de Loire to cross northern France and join the Via Francigena near the Swiss border. 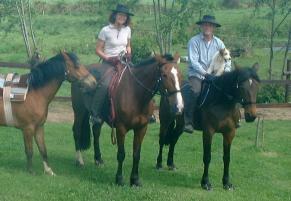 We: Babette, Paul and Vasco, chose to use Gwen and Lubie as our mounts, but on this trip to travel without a pack horse. The journey took 88 days with our final arrival in St Peter's, Rome taking place on September 27, 2006. The journey proved far more challenging than the St James Way, involving pathfinding as we crossed France, traversing of the Alps at above 2500 metres and searching for safest way for our horses along the Via Francigena. Nonetheless the experience has done nothing but add to our love of the pilgrim life. We will be producing a second book to cover this journey and will publish many more photos and information on this site as soon as we fix the computer that was one of the casualties of the journey. For information about Babette's book about their ride to Santiago, "Riding the Milky Way", please click here.